This "Rustic Ramble" presents a challenge to our trail finding ability in getting out of the canyon. We should expect to spend some extra time looking for the trail, so it's best to do this hike on a day when we are not on a precise schedule. Drive to Marvin Braude Mulholland Gateway Park. This is at the south end of Reseda Boulevard. Go uphill from the Park on a dirt road until reaching Mulholland. Turn left and hike east on Mulholland past the Bent Arrow Trail on our right. Turn right on a very steep trail down into Rustic Canyon. If we have doubts as to the trail, look at a telephone pole across the road. It is number 112509M. Upper Rustic Canyon, being rugged and isolated, is seldom visited so we will be walking along a trail overgrown with brush, and rough spots underfoot. After about 500 yards of very steep, "brushy" trail we will reach a streambed where we will turn left. Get ready for some boulder hopping. Rustic Canyon is full of rocks that resemble small "blackboard slates," "giant speckled eggs" some "concrete" rocks, but no "spaghetti" rocks. Also look for tracks made by raccoon, coyote, and deer. Common with most streambed travel in these mountains is the fact that every storm changes the terrain so that last year's sandy trail can be this year's mosaic of boulders. The elevation drop along this intermittent stream is gentle and presents few hazards to travel. Twenty-five minutes after first reaching the stream we will come to another streambed entering from the right. This West Fork is the first major stream joining from the west, and although it is a significant stream it is possible to pass it by because of the trees and brush growing in the canyon. Turn right and go upstream in the bed of the West Fork for nine minutes. At this point on the left (south) a trail goes up the steep hillside and heads southwest. As the beginning of this trail may be difficult to spot, I'll give my clues. It is about 750 yards from the fork in the stream where we turned right (but seems much farther). We will have passed an overgrown arroyo that enters from the north. The trail shows up soon after we make a right turn coming up the streambed. Two rows of rocks on the left give a hint of the trail and it seems enough. Overshooting is no problem---just come back. A crew of volunteers on maintenance work renamed it the "Bay Tree Trail," and it is justly named. Follow the trail up through Sycamore, Oak, and Bay. Oh, that Bay!! If you have never experienced the clean pungent smell of fresh Bay leaves, you are due for a treat. Some call it Laurel. In Oregon it is Myrtlewood, but by any name you will long remember the scent of Bay. Take a deep breath because this trail will gain over 800 feet in not much more than a mile, mostly under a verdant canopy of leaves. Soon we will pass a spring -- not gushing, but more of a seepage. Once a cup hung on the tree and the water was drinkable, but the cup is gone and leaves have settled into the small basin. We leave the water for coyotes. Later we will discover a sheltered recess that is sanctuary for a trickling stream. The vegetation changes as elevation is gained, and the charm of sylvan enchantment gradually shifts to views of rugged terrain. In fall and winter, dotting the slopes across the canyon are orange-red splashes of Toyon berries on a palette of green chaparral. On the skyline to the west the craggy outline of Cathedral Rock comes into view. Embracing the trail on either side, and adding to its enchantment, are the Holly-leaf Cherries, commonly called Islay. This big-seeded sweet cherry ripens late in the summer along this trail and is a favorite food of the coyotes. It is rare but there is also some Chaparral Currant along this trail. During the summer the Chaparral Currant drops its leaves in order to conserve moisture; but watch what happens a couple of weeks after the first fall rain-- look for bare twigs with rose-colored flowers. Thanksgiving is an interesting time of year to be on this trail. The Chaparral Currant is pushing spring -- and fall is hardly over. Now, continue climbing the trail until reaching Rogers Road, then turn right. As we head west on Rogers Road, notice the beginning of Temescal Canyon on the left. Only a small part of Temescal Canyon is in view, but I mention it because on this hike we will be at the headquarters of five different watersheds. Temescal, Santa Ynez, Garapito -- which drains into Topanga -- Caballero, and Rustic. 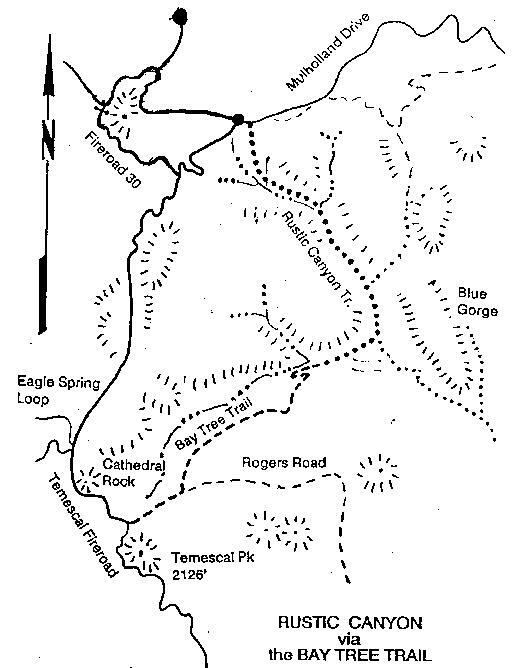 After a short uphill walk on Rogers Road the route joins Temescal Fireroad at the crest of the ridge. We should then turn right and walk north. A third of a mile northwest on this relatively level fireroad, look to your right for an imposing rock formation. "Cathedral Rock" dominates this part of the ridge and is an ideal lunch stop. The easiest way is to walk up the steep southwest slope through a gap in the rocks into a sheltered amphitheater that can comfortably hold a group of 25-50 people (if you're very good friends). The view to the east from this massive hard coarse conglomerate rocky crag is spectacular. The entire panorama of the first part of the hike is spread out below and the ruggedness of upper Rustic Canyon is impressive. Now that our hunger has been satisfied, and our pack lightened a bit, continue north on the fireroad and upon reaching Hub Junction go straight ahead toward Mulholland Drive. The road stays on the ridge separating Garapito Canyon on the west from Rustic Canyon on the east. We hike the 2 miles to Mulholland, turn right and keep our eyes peeled for a trail on the left taking us to our cars. On this trip we see a variety of geological features that could be of interest to the casual observer as well as to the serious geologist. With the exception of the first part of the hike coming down to the streambed, all of Upper Rustic Canyon and the trail to the Temescal Fireroad is on Santa Monica slate, a dark-gray to black rock that was formed 150 million years ago during the jurassic epoch. Subsequent granitic intrusions into the Santa Monica Slate are not in evidence in the canyon but some granite boulders could have eroded from the granitic outcropping just east of Gizmo Peak (Pk 1960).